Engraving of the American Express Line steamboat ONTARIO, whose captain was Horatio Nelson Throop of Pultneyville, NY. 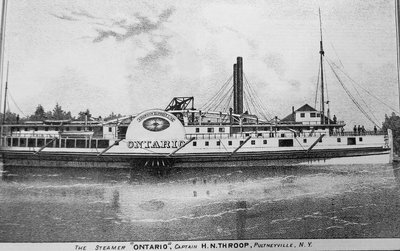 Steamer "Ontario" Built at Clayton 1847 by John Oades for Ontario & St. Lawrence Steamboat Co. 232'1" x 32'2" x 11'6" 832 tons. Cut by ice while at anchor, Nov. 13, 1883, at Chenaille du Moine, Sorel, P.Q., and sank; became total loss.